Personnel – Wanja Slavin: alto saxophone; Philipp Gropper: tenor saxophone; Tom Arthurs: trumpet (#1); Erik Kimestad Pedersen: trumpet (#2-7); Rainer Bohm: piano, rhodes; Andreas Lang: acoustic bass (#1); Bernhard Meyer: electric bass (#2,3,4); Petter Eldh: acoustic and electric bass (#5,6,7); Tobias Backhaus: drums (#1); Nasheet Waits: drums (#2,3,4); Ivars Arutyunyan: drums (#5,6,7). 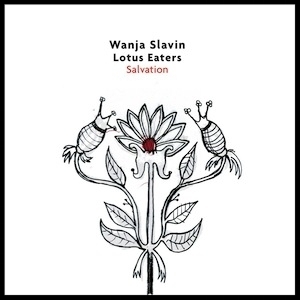 Wanja Slavin is a first-call German saxophonist who has been a beacon of small groups operating mostly in the avant-jazz and prog rock genres. His most charismatic group, The Lotus Eaters, has changed members and became more flexible. The new album, Salvation, comprises five originals plus one standard and features three different formations of old friends. Each note plays a big role in the process, just like each chord fills us with its richness and resonance. The title track opens doors for a relevant modern music that is both fulfilling and evolutionary in the way jazz is heading these days. This piece can be dark and feathery at the same time, bringing Andrew Hill’s cryptic universe to my mind. A crystalline trumpet that evokes Kenny Wheeler strikes with an ingratiating emotional punch while the saxophonists' language articulates with quality and displays an engrossing tone. Indeed, the well-hooked horn section works nice and tight, emitting squeaks and squawks at the end. “WS1” and “WS2” are dressed in fantastic arrangements. The first version, boosted by Nasheet Wait’s syncopated beat, carries a unique, intermittent vibe that seems equal parts inspired by funk and electronic music. The melodic lines are complex and sometimes jarring, befitting the idiosyncratic atmosphere created. Everything is modern creative with tantalizing prog-rock incursions. Even presenting three alterations in the band for the second version, which is also prone to syncopation, the sound is fueled by a searing heat and a fully adjusted drive. On “Melancholy1” and “Melancholy2”, the band paints the same feeling with different brushstrokes. Whereas the former is an Eberhard Weber-like symphony with epic avant infusions, supportive synth texture, and a dashing piano improvisation, the latter floats with poignant melody, suggesting an idleness that feels more mysterious and obscure than relaxing. On Jimmy Van Heusen’s “Moonlight Becomes You”, Slavin shines a bright new light on a classic piece. Preserving the original romantic touch, the song comes configured with pure and sophisticated refinement and features frontal improvisations from bass and piano. The recording comes to an end with the ternary “Love Song”, where the band attractively blurs the line of balladry with intentional precision. This is what I call intelligent jazz. Without assuming a spotlight-craving role, Slavin assures a responsive treatment to his compositions and still makes everyone shine. Salvation got me hooked on its contemporary charm.